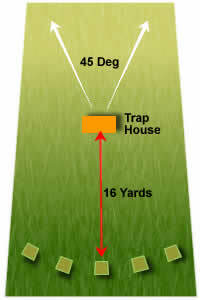 Automatic Ball Trap (ABT)is similar to DTL in that the clays are fired away from you from a trap in front of you. But there the similarity ends with ABT producing more challenging targets, and the sequence of shooting differing entirely. ABT is probably best shot by people who have shot other disciplines (such as DTL) before, as a newcomer to the discipline will find the changing of shoot positions and the variety of target presentation fairly daunting. ABT is shot with a squad of six shooters, one on each of the five positions, and the sixth moving onto position 1 after that shooter has shot. Each shooter fires from the position that they are on and moves to the right. When you reach and shoot position 5 you move round the back to position 1 (with the gun broken and empty as per safety rules). So the sequence is shoot and move until the shooter has shot at 25 targets. Targets will be called from the mounted position, the shooter has full use of the gun to break the target. As with other disciplines a tally of broken targets is recorded. If you are serious about this then the gun of choice is a trap gun with a tight choke set-up. The choking should be around 3/4 & full. Basically there is only one cartridge to use, a high performance plastic wad cartridge. Size must be either 7 or 7 1/2.